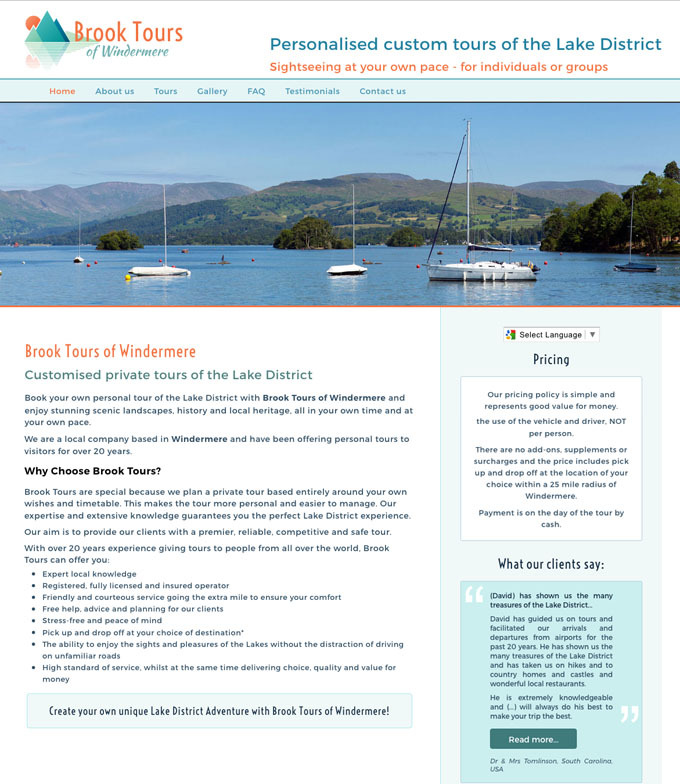 New website design for local taxi company offering custom tours of the Lake District. Brook Tours of Windermere is a local company based in Windermere, owned and managed by David Brook. The company has been established for over 20 years offering a taxi service, including airport runs, and custom tours of the Lake District. The company offers a personal and helpful service that has proved popular with visitors to the Lake District from the USA, Japan and many other countries. David goes out of his way to be super helpful and has in depth knowledge of the area which enables him to advise on the best itinerary for his clients. Although the client has been trading for a long time, this is a new website intended to assist with the promotion of his customised tours. The client needed a new logo designing that he could also use for stationery. The logo design used a graphic from Fotolia and a high res version of it was also supplied.